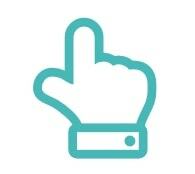 Use one platform for marketing material, product data and logos. 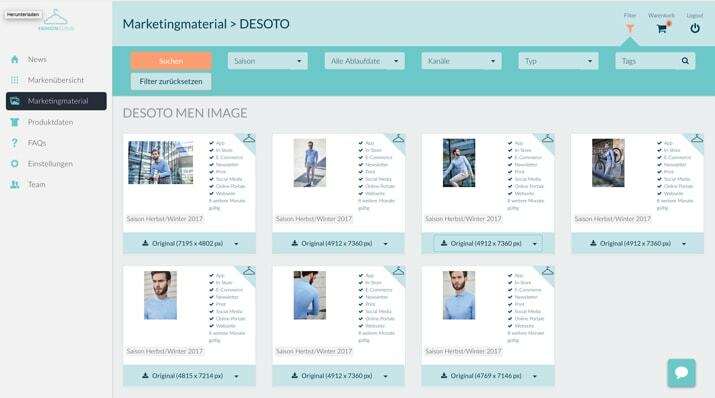 As a premium brand, DESOTO provides you free access to their content on Fashion Cloud. Download content with just a few clicks and save valuable time when searching for pictures. Use the content in many different channels, including webshops and merchandise management systems. How does the content platform work? DESOTO and many other brands are uploading marketing material, product data and logos to the platform. You as retailer can search for specific pictures on the platform and download them with just a few clicks. 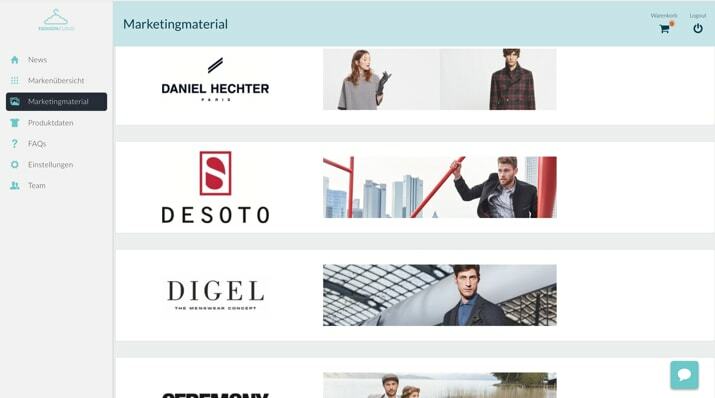 The pictures can be used for different marketing actions Fashion Cloud even reminds you about expiring material via mail. 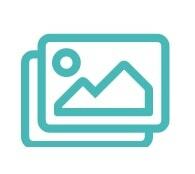 You can look for marketing pictures either by season and tags or by different features. Product data you can even search by EAN and article number. What kind of content do I find? The content consists out of marketing material, as for example pictures and logos, as well as, product informations like product pictures and product descriptions. The Pictures, videos and other content can be downloaded alone or as package in the shopping cart. This even in different resolutions! Want to know more about the functions? Visit our FAQ. 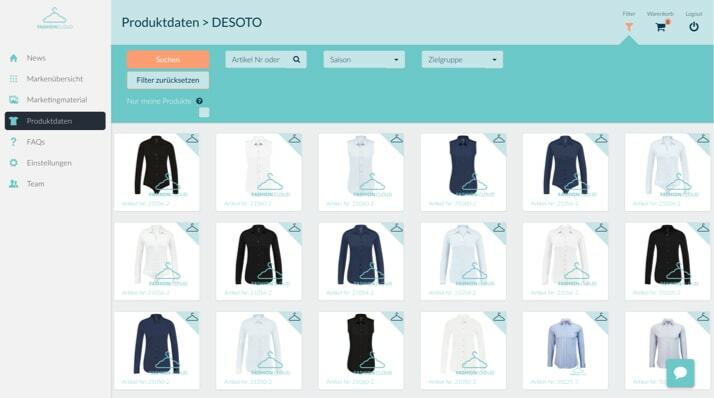 Want to automatically integrate your pictures into your merchandise management system or you webshop? Contact us. How do I register at Fashion Cloud? Register for free with the button below. You will then receive a verification mail. NOTE: The mail sometimes gets caught in the spam folder! Confirm the verification mail to complete the registration and log in to the content platform. Send DESOTO an access request in the brand overview. NOTE: It can take up to 2 days until the brand has accepted your request. Fashion Cloud is Europe’s leading B2B platform and works with over 350 brands and 5,000 retailers from 60 nations. Via the Fashion Cloud web-platform, brands are able to share product data and marketing material (Content) with their retailers. In spring 2019, re-ordering will be possible via the web-platform as well and thus the re-ordering of articles in larger quantities. In addition to the web platform, Fashion Cloud also offers retailers the opportunity to use the Clara App to reorder missing items directly at the POS, thus expanding the product range in the retail shop, including the stock of participating brands. OrderWriter, the buyer App by Fashion Cloud offers buyers a complete overview of products, orders and budgets right there, at the showroom. Through a variety of integration options, such as product attributes in their own web shop or delivery availability in third-party solutions for digital aisle extensions, Fashion Cloud also offers the option of using the data and solutions in their own IT systems. Have more questions about the marketing material of DESOTO? The Account Management Team like to help you! With the free account you have unlimited downloads of the premium brand content, like DESOTO. For all further brands you have a limit of a total of 5 downloads per month. If you want to download more, then please contact Fashion Cloud. Become part of Europe’s leading B2B platform in the fashion industry!